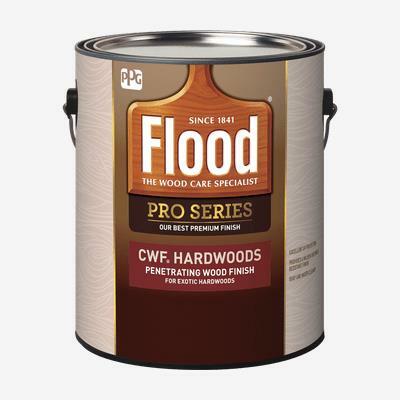 FLOOD® PRO CWF® Hardwoods Penetrating Wood Finish is specially formulated to bring out the natural beauty of exotic hardwoods. Recommended for use on any properly prepared exterior hardwood, including decks, fences, siding, railings, outdoor furniture and other wood surfaces. Apply to new, dry, pressure-treated wood, uncoated new or weathered wood, or wood previously stained or painted. Apply directly to weathered wood previously finished with FLOOD® PRO CWF® HARDWOODS; other previous coatings must be completely removed.